With more and more people enjoying the immersive experience of 3D movie brought to them, 2D movie is gradually outdated. With a suitable 2D DVD to 3D videos converter in hand, you can easily convert 2D to anaglyph 3D. After creating anaglyph 3D, you can wear 3D glasses to enjoy the anaglyph 2D on 3D players. Part 1: What is 3D film? We often heard the term 3D and most of us have all seen the movie titled with a “3D”. We put on 3D glasses to have a more vivid view of the film. But what exactly is 3D video? A 3D film stands for three-dimensional stereoscopic film (also known as three-dimensional film, 3D film or S3D film) is a motion picture that enhances the illusion of depth perception, hence adding a third dimension. A 2D film, as you can conclude now, is a motion picture which has only two dimensions. The most common approach to the production of 3D films is derived from stereoscopic photography. In it, a regular motion picture camera system is used to record the images as seen from two perspectives (or computer-generated imagery generates the two perspectives in post-production), and special projection hardware and/or eyewear are used to limit the visibility of each image in the pair to the viewer’s left or right eye only. 3D films are not limited to theatrical releases; television broadcasts and direct-to-video films have also incorporated similar methods, especially since the advent of 3D television and Blu-ray 3D. 3D films have existed in some form since 1915, but had been largely relegated to a niche in the motion picture industry until 1950s, and later experienced a worldwide resurgence in the 1980s and 1990s driven by IMAX high-end theaters and Disney themed-venues. 3D films became more and more successful throughout the 2000s, culminating in the unprecedented success of 3D presentations of Avatar in December 2009 and January 2010. Part 2: How to convert 2D to 3D? 2D-to-3D conversion adds the binocular disparity depth cue to digital images perceived by the brain, just like turning a “flat” video into a stereo one, thus, if done properly, greatly improving the immersive effect while viewing stereo video in comparison to 2D video. However, in order to be successful, the conversion should be done with sufficient accuracy and correctness: the quality of the original 2D images should not deteriorate, and the introduced disparity cue should not contradict to other cues used by the brain for depth perception. There is one simple approach to convert 2D video to 3D video – add the 3D effect during the 2D DVD to video conversion. To convert DVD to digital video, you can use a DVD Ripper to convert DVD to digital video. The best DVD Ripper I have used is Leawo DVD Ripper. 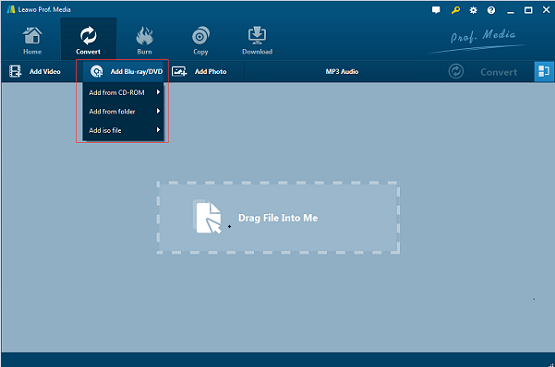 Leawo DVD Ripper is a professional DVD to Video converter for you to rip, backup, edit and convert DVD to video in variety of formats like MP4, WMV, MKV, FLV, MP3, AAC, M4A, RMVB, F4V, etc. Thanks to the wide output video formats,limited format issue will never bother you. You could expand your DVD movie enjoying to any mobile device just like iPhone 5, Galaxy S3, Lumia 920, PS4, Xperia Z, Surface and more. Not merely a DVD converter, Leawo DVD Ripper also includes a handy video editor that allows you to trim, crop, add effects and watermark to source video. With the popular 2D to 3D converting ability, you can get vivid 3D movie experience with your 2D DVD movies. Still, some other user-friendly features include: set output file parameters, select and retain subtitle and audio track, merge files into one, batch converting, etc. On top of that, you can even create 3D movies out of 2D DVD content in 6 different 3D effects for different 3D players and retain subtitles from source DVD movies for better movie enjoying. No matter what kind of DVD you want to grab and how you want to convert it, Leawo DVD Ripper can do it for you with an amazing speed by using the leading NVIDIA CUDA acceleration technology. 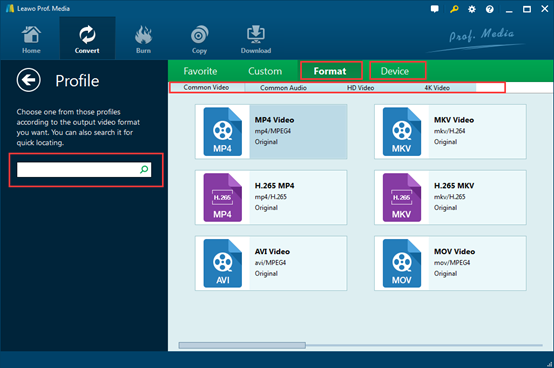 In short, Leawo DVD Ripper can provide you a fast and quality lossless experience for 2D to 3D conversion. Here is a super guide on how to convert 2D to 3D with Leawo DVD Ripper. 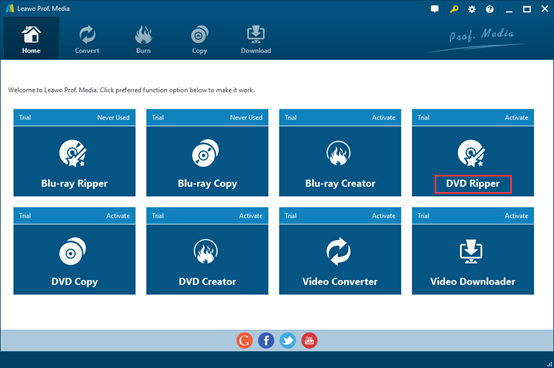 You have 2 options to load DVD content: Under “Convert” section, click “Add Blu-ray/DVD> Add from CD-ROM” button to load source DVD content or drag iso file directly for converting. Click the drop-down box next to the “Add Photo” button, and then click “Change” to select output format. There are many video and audio formats for your selection ranging from Common Video, Common Audio and HD Video. You could even select output format according to your device under “Device” tab. By making use of the Profile Search bar on the left side, you could quickly search out desired format. Here I use HD MP4 for example. 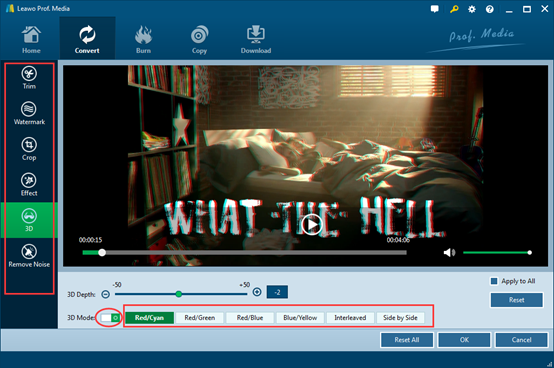 Click the little film icon at the right of the video bar to enter the editing interface where you can trim, crop, remove noise, add watermark, effect or 3D effect! There are 6 types of 3D effects for your choice: Red/Cyan; Red/Green; Red/Blue; Blue/Yellow; Interleaved and Side by Side. Remember to turn on the little switch before you can choose 3D mode. Step 5: Convert 2D to 3D. Here I use Red/Blue mode as example. You can click “OK” to save your mode setting, then click the big green "Convert" button on top left. A sidebar will be called out, you need to choose saving directions and click "Convert" on the bottom again. And there you go, 2D to 3D conversion is done. Easily done, right? After the 2D to 3D conversion, you could freely transfer the converted 2D movies (now in 3D effect) onto your 3D movie player for vivid 3D movie enjoying.